U.S. Supreme Court nominee Brett Kavanaugh./PBS screenshot. Lawyer Michael Avenatti has released an affidavit by a woman who says U.S. Supreme Court nominee Brett Kavanaugh was a “mean drunk” at house parties in the early 1980s, was physically aggressive toward girls and participated in efforts to get them drunk before gang rapes occurred. Julie Swetnick says in the affidavit that she was gang raped at one of the parties. Swetnick says she was incapacitated and not able to fight off the boys, and believes she had been drugged with Quaaludes or something similar. Kavanaugh is scheduled to testify Thursday before the Senate Judiciary Committee, which is considering his nomination. Also slated to testify is Christine Blasey Ford, who has alleged that Kavanaugh pinned her to a bed during a party in the 1980s when both were high school students, tried to pull off her swimsuit, ground himself on top of her, and covered her mouth. Ford says Judge was also present, but Judge is not scheduled to testify. 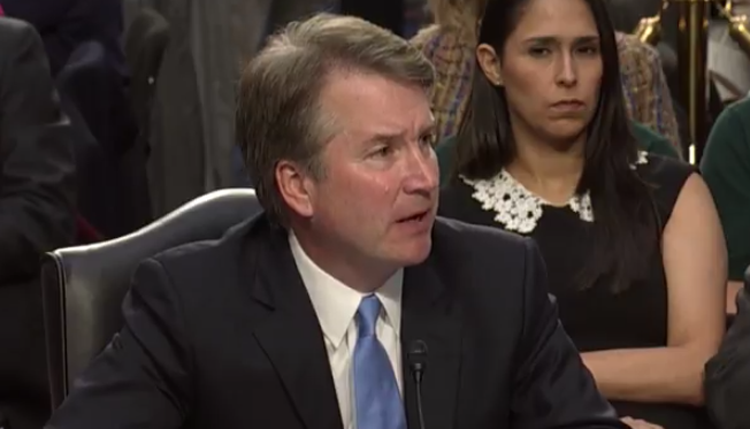 In prepared remarks for the committee released Wednesday, Kavanaugh says he drank beer in high school and “sometimes had too many,” but he did not sexually assault Ford, report the Washington Post and TPM. Swetnick says in the affidavit that she is a graduate of Gaithersburg High School in Gaithersburg, Maryland, and has active security clearances for work with the U.S. Mint, the Internal Revenue Service and the U.S. Treasury Department. “On numerous occasions at these parties,” Swetnick wrote, “I witnessed Mark Judge and Brett Kavanaugh drink excessively and engage in highly inappropriate conduct, including being overly aggressive with girls and not taking ‘No’ for an answer. This conduct included fondling and grabbing of girls without their consent. “I also witnessed efforts by Mark Judge, Brett Kavanaugh and others to ‘target’ particular girls,” Swetnick said, “so they could be taken advantage of; it was usually a girl that was especially vulnerable because she was alone at the party or shy. “I also witnessed efforts by Mark Judge, Brett Kavanaugh and others to cause girls to become inebriated and disoriented so they could then be ‘gang raped’ in a side room or bedroom by a ‘train’ of numerous boys. I have a firm recollection of seeing boys lined up outside rooms at many of these parties waiting for their ‘turn’ with a girl inside the room. These boys included Mark Judge and Brett Kavanaugh.